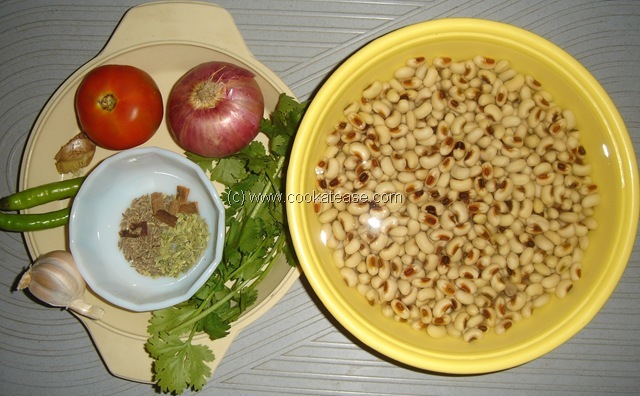 Karamani (Black Eyed Peas) belongs to beans family. It is also called as Black Eyed Beans. In north India it is known as Lobia. In south India, Karamani is also used to prepare Sundal. 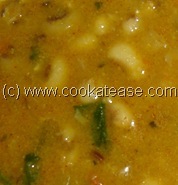 As it is cooked as whole dal, it is rich in fibre. Soak lobia or karamani for 6 to 8 hours; wash well before use. Grind the items given for grinding. Keep a cooker on the flame, add oil; do the seasoning, add ground items and fry for 1 minute. Now add turmeric, chili, coriander powder and fry till oil separates. Add salt, lobia and mix well; add 2½ cups of water and pressure cook. You can keep in low flame for 5 minutes after the first whistle. Karamani Kuzhambu suits well with Rice, Paratha, Chapatti. 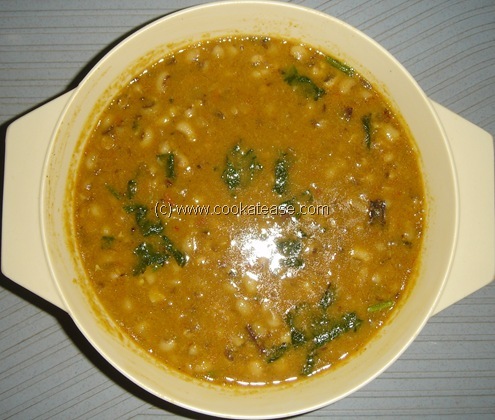 Though Karamani can be cooked without soaking, in this dish it has to be soaked. Over cooking in pressure cooker has to be avoided.